Oldfield Smith & Co is a fully independent professional practice of Chartered Surveyors, regulated by RICS and specialising in commercial property. We are also an RICS approved training firm and actively welcome the opportunity to support and develop the next generation of property professionals. providing the highest levels of service and will take the time needed to listen to your requirements and ensure we meet these fully. Our ethos underpins everything we do and defines the distinctive nature of the service we provide at Oldfield Smith & Co. You can read more about this by clicking on the link to the right, where you will also find biographies for our key members of staff. The company is jointly owned by Richard Oldfield and Bernard Smith, who between them have over 50 years of experience in industry. Both have successfully run their own businesses in the past, so have an intimate knowledge of the challenges faced by companies trying to grow and develop. In 2014 Oldfield Smith & Co were voted “Best New Business” in the Uckfield Business Awards, organised by the Uckfield Chamber of Commerce. 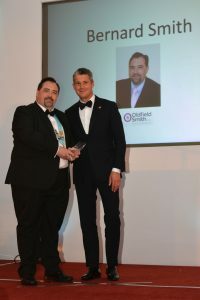 At the following awards in 2016, Bernard Smith was voted Business Person of the Year (male). With offices in Uckfield and Gatwick, we operate predominantly in the South East of England, London and the West Midlands, but can offer nationwide coverage for larger projects and professional services. To find our more about our coverage and areas of operation, click >>here<<. 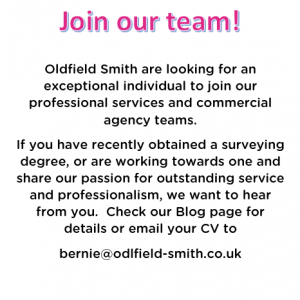 Oldfield Smith & Co is a Disability Confident Committed employer and actively seeks to promote equality and diversity. I am writing to say a big ‘thank you’ to Bernard for his professional opinion with regard to a lease on a tea shop my daughter voiced an interest in. I would like Bernard to be acknowledged at 4N for the assistance he has given to my daughter. Whilst at one of the Uckfield 4N meetings I remember Bernard, during a presentation, talked about the ‘pitfalls’ with regard to commercial leases. He suggested it more prudent to let a Commercial Chartered Surveyor read through a lease prior to signing, as the surveyor had the experience to ‘decipher’ the contents therein for the benefit of the lessee. I contacted Bernard and asked if he would mind reviewing the lease my daughter had been offered and what his opinion of entering into the arrangement would be. Bernard acted very promptly and based on his ‘comprehensive’ opinion, my daughter did not proceed. When originally contacted Bernard said he would only charge for his work, (and the fee would be agreed) if the lease required further clarification etc.. Bernard did not charge a fee in this instance and saved my daughter a lot of money! I would like to say that I can highly recommend Bernard to anyone who may be considering going into business where a lease is required.